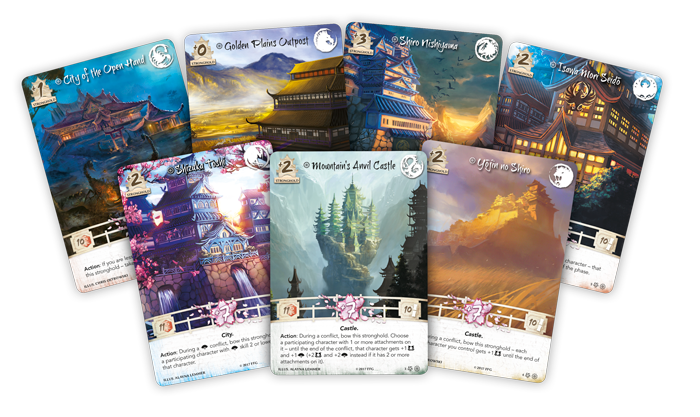 Before Rokugan opens to the world with the release of the Legend of the Five Rings: The Card Game Core Set, two exclusive events will give players a preview of the secrets that lie within. At Gen Con 50—August 17-20, 2017 in Indianapolis, IN—a full slate of events will follow Thursday’s once-in-a-lifetime spectacle of the Opening Ceremony. Then the Kiku Matsuri will feature five rounds of play, with a bevy of prizes for participation and performance. Friday and Saturday’s Gen Con Tournament will feature additional prizes and continue until a single winner is crowned. The top tournament finisher from each clan will make the fateful choice of which role their clan will fulfill at the first Winter Court World Championship! The Casual Gen Con Tournament on Sunday will close out this historic weekend with a fun event for all those looking for one last chance to play the game before heading home. In London, on September 2, 2017, the invite-only Honored Preview Event will host 100 players. 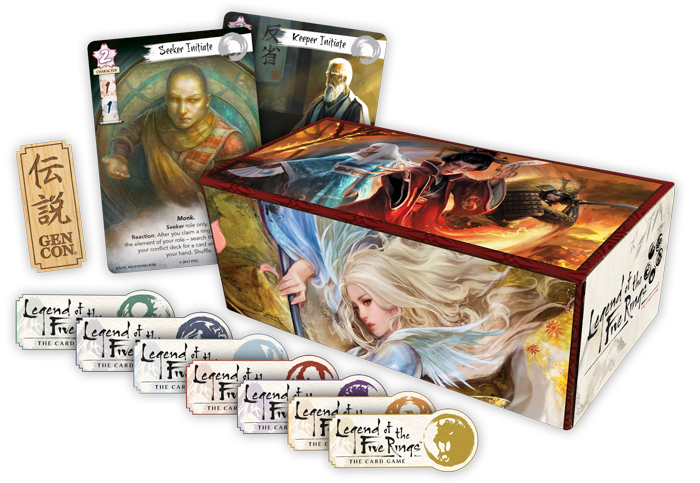 They too will have the privilege of experiencing Legend of the Five Rings: The Card Game before the release of the Core Set, receiving a free copy and competing for fantastic prizes! Read our announcement article for more information on how to apply on Facebook or Twitter using the #L5RHonored hashtag! The application window has been extended, and now closes at 11:59 PM Central Time on August 1st. Competing for the glory and honor of your clan is often reward enough. However, a multitude of prizes awaits those who would claim victory over their foes! Read on to find out how the prizes pictured below will be awarded at each event. Click on each image to view a larger version! Participating players in Thursday's tournament will receive a Core Set with which to build their decks, a full-color deckbox, and a pin for their chosen clan! For playing and completing the first three rounds of the event, each player will be awarded with a commemorative Gen Con first player token. Players also get six copies of the extended art Way of the Clan card for their chosen clan. 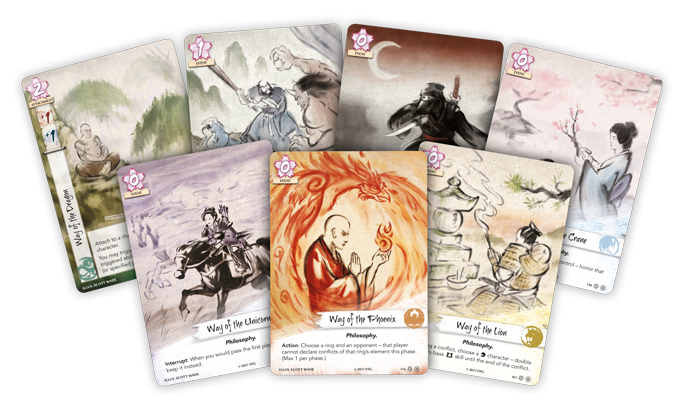 At the start of each of the five rounds, they will trade one of these cards for one of their opponent's, learning the ways of the opposing Great Clan. The winner of each game during rounds 2 and 3 receives a Keeper Initiate extended art card. For rounds 4 and 5, the winner of each game receives a Seeker Initiate extended art card. Players that win at least three of the five rounds will receive a glossy plastic version of their clan's stronghold. The esteemed Hatamoto title is bestowed on each player who completes all five rounds undefeated. This achievement awards incredible prizes, a reserved seat for purchase at the next World Championship, and recognition in the Hall of Honor. This group of newly-promoted Hatamotos will briefly discuss and then cast votes to decide the very first story choice, helping to shape the future of Rokugan! Participating players in the Friday tournament will receive a commemorative Gen Con first player token. Players also get six copies of the extended art Way of the Clan card for their chosen clan. At the start of each of the first five rounds, they will trade one of these cards for one of their opponent's, learning the ways of the opposing Great Clan. The winner of each game during rounds 2-4 receives a Keeper Initiate extended art card. For rounds 5-7, the winner of each game receives a Seeker Initiate extended art card. Players that win at least four of the seven rounds will receive a glossy plastic version of their clan's stronghold card. At the end of the seven Swiss rounds, the top two players for each clan by standings will earn the esteemed Hatamoto title. Any player who does not earn the Hatamoto title this way and successfully reaches the Top 4 on Saturday will also be promoted. The Hatamoto title awards incredible prizes, a reserved seat for purchase at the next World Championship, and recognition in the Hall of Honor. At the end of the seven Swiss rounds, the top player for each clan by standings will participate in a Roles of Rokugan ceremony to choose the clan roles for the first Winter Court World Championship! They will each receive a commemorative stone role card featuring their selection. After each game during the seven Swiss rounds, the player with the most honor will be recorded (the winner of the game wins ties). This distinction will be totaled by clan over all seven rounds and then divided by the total number of players who selected that clan to find an average for each clan. Each player from the clan with the highest average at the end of Swiss rounds will receive a set of metal honor tokens. Players who progress to Saturday's cut of Top 16 single-elimination rounds will receive an engraved and painted acrylic honor dial. The Top 8 competitors win a full set of each clan's glossy plastic stronghold card. Players who reach the Top 4 are awarded a double-sided, engraved, wooden Imperial Favor card, in addition to gaining the esteemed Hatamoto title if not yet earned at the end of the Swiss rounds. Second place wins a colorful finalist plaque. The champion of the Gen Con tournament takes home a gorgeous acrylic champion trophy! Participating players in the Casual Tournament on Sunday will receive a commemorative Gen Con first player token. Players will receive the Way of the Clan card for their clan upon completing Round 1. 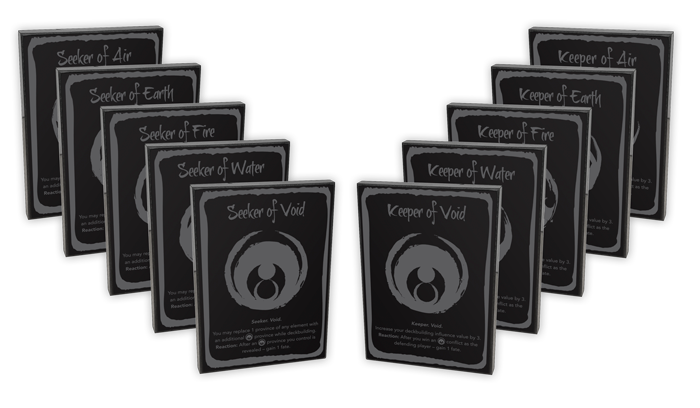 The winner of each game in Round 2 will win a Keeper Initiate extended art card. The winner of each game in Round 3 will win a Seeker Initiate extended art card. Participating invitees will receive a Core Set to build their decks with, a full-color deckbox, and a pin for their chosen clan. The esteemed Hatamoto title is bestowed on each player who completes all five rounds undefeated. This achievement awards incredible prizes, a guaranteed seat for purchase at the next World Championship, and recognition in the Hall of Honor. 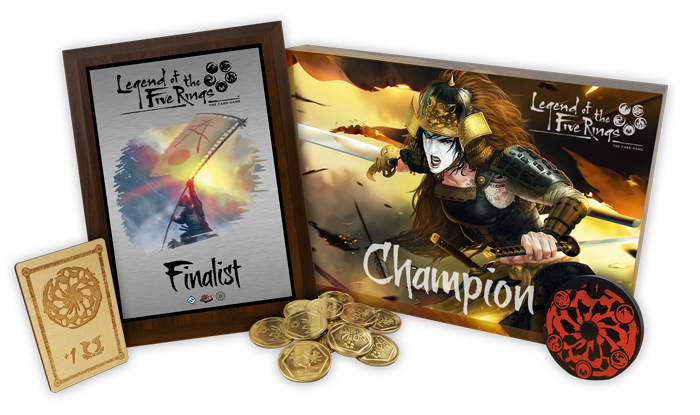 We will also choose our favorite #L5RHonored application from each clan's attendees, and award those players with a set of metal honor tokens. The Kiku Matsuri event on Thursday lasts for five Swiss-paired rounds. This tournament will have a casual focus, ensuring a fun environment as players explore the game. Each round has an extended time limit to facilitate learning: 15 extra minutes for the first round, 10 extra minutes for the second and third rounds, and 5 extra minutes for the last two rounds. Only each player's win/loss record is tracked as they compete. The total wins for the top 25 competitors from each clan will play the largest role in the contest for the Emperor's Favor! The Gen Con Tournament begins with seven Swiss-paired rounds on Friday, followed by a Top 16 cut to elimination rounds on Saturday. Each Swiss round has an extended time limit with 5 extra minutes to accommodate players as they become familiar with the game. The Tournament Regulations will be used, but the focus will still remain fairly casual. The Casual Gen Con Tournament will offer three Swiss-paired rounds of play. The focus will be extremely casual, ensuring a fun environment for players to close out their weekend at Gen Con. The Honored Preview Event on September 2nd in London will take place over five Swiss-paired rounds. A casual focus will ensure a fun environment as players explore the game further. Each round has an extended time limit to provide for learning: 15 extra minutes for the first round, 10 extra minutes for the second and third rounds, and 5 extra minutes for the last two rounds. Only each player's win/loss record is tracked as they compete to prove their clan's honor, and earn fantastic prizes! GEN CON, the Gen Con logo, and The Best Four Days in Gaming! are trademarks of Gen Con LLC. All rights reserved. Used under authorization.